It has been a LONG time since we visited this shop. The last time was somewhere in October 2010. It was a Sunday and the restaurant was very full. But surprisingly the service was very fast. As soon as our bum bum touches the stool, a lady came and takes our order. Too bad no Kopi-O. We had a pot of Chinese Tea instead. The Tea was served very fast too. Waiters/Waitress bearing trays of Dimsum drop by our table non-stop. Papa also very "efficient" in snapping up the Dim Sum. There! The chopstick tengah "kiap" the fish balls is Papa's. 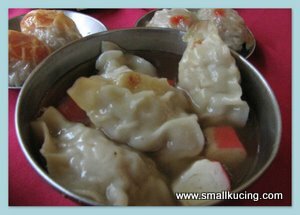 Sui Kow(Dumplings) Taste quite good. But Mamarazzi didn't like the crab stick so Papa had the Crab Sticks. Wu Kok(Chinese Yam Paste with Meat Filling). Taste good when fresh from the wok. 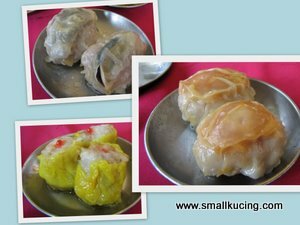 Some of the dimsum that we had. Love the one with the Salted Egg Yolk on the top. One of the "Premium" dimsum. Got something that look like "sharkfin" on top. A lot of prawns in it. The yam paste is the one of the those I always choose at dim sum, esp at the row of SS2 shops on Sundays. On the nangka seeds, just grab any one of my curry recipes and add it as an extra. For the stir-frying, curry leaves, chillies, ginger, garlic or the Chinese style also can. Try and I bet you will enjoy it. Oooo...looks so good. Haven't had dim sum for a while now, must go one of these days... Yummmmm!!! 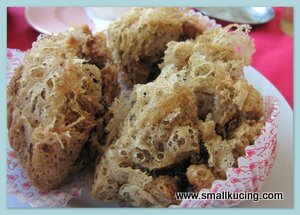 yeah, i also don't find the crab stick appearing together with the dumplings appealing.. but i like the "Wu Kok" leh, looks nice.. Weekend memang crowded...but their service considered fast. U didnt order the porridge? next time you got post post healthy food posts or not? Yum.. haven't had dim sum in a while. Nice spread! How's the pricing? Oh the dimsum now comes in two's instead of three's per plate. 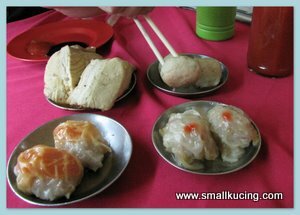 In time to come one piece siew mai in one plate, one fish ball in another plate. 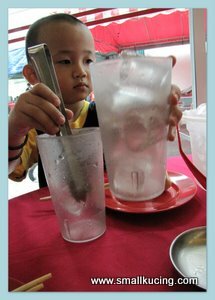 When as a kid thought I saw 4 siew mai or har kao in a plate one? Shrinking in a nicer way? Wow Papa is pretty fast with chopsticking, you better practise more kiap-ing kungfu from now. Never had dim sum with salted egg yolks before. Must keep an eye on some of those if I go for dim sum again. anyhow thanks for droppin by my page last nite he he mamarazzi dah dinner? OH my goodness...that looks so delicious. Gimme some Dim Sum! 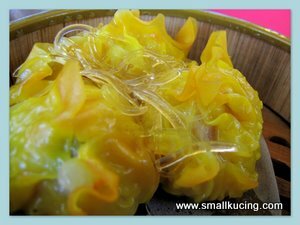 THis post reminds me that long time I didn't eat dim sum already. Oh I think I have been to this restaurant before but many years ago. They are still there? Oh I LOVE salted eggs!